Hello All! I know it’s been a few weeks since my last post. 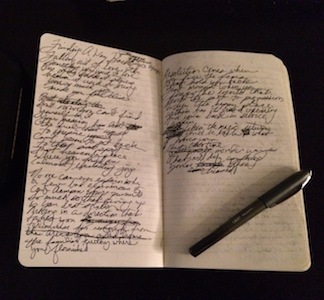 Outside of my crazy work schedule, I’ve been revising, editing, and selecting poems for my next two projects. The first project is a chapbook which I’m pushing to release later this year. The second project is my next full length volume of poetry which I’m hoping to release in late 2015/early 2016. Titles for each project will be forthcoming. I look forward to sharing more details as the process moves along. I also have a few events coming up this month. I’ll be doing a reading at Open Mic at Busboys & Poets (Shirlington) in Arlington, VA | 5/12/2014 | 8PM-10PM. The open mic will be hosted by Joseph LMS Green and the featured poet is Dasha Kelly. I’ll be the spotlight poet for the evening. Tickets for the event are $5 and can be purchased the day of the event (beginning at midnight) via Busboys & Poets/Eventbrite. I’ll also be doing a reading as part of the 2014 DC Black Pride Writer’s Forum in Washington, DC | Grand Hyatt Washington (Lafayette Park Room – Independence Level) | 5/24/2014 | 12:30PM-1:45PM. If you’re in the area, please come out and support! This entry was posted in Books, Events, Images, Poetry, Tomorrow's Seduction: Kiss of Death, Warsan and XPerience J, Writing by BuddahDesmond611. Bookmark the permalink.